HOME OF THE 2017 BARON CUP CHAMPIONS! CVCA ROYALS -BARON CUP CHAMPIONS 2017!!! February 13th 2017. The CVCA Royals have had an amazing ride this season. Midway through the season the team had a record of 1-10-1 and had to be the least likely team to even qualify for the Baron Cup awarded to the league playoff champions. But this group never wavered and never gave up. They went on a tear through the second half of the season behind some excellent leadership from their captain Hayden Dickerson and assistant captains Noah Polanski, Bayley McRitchie and Christian Beckett. This along with the amazing goal-tending of Brooks Montgomery enabled the Royals to go on a 14 -4-0 run and qualify for Baron Cup on with their last win of the regular season. The Royals were the lowest seed in their bracket and had to open against Avon Lake who was undefeated in league and heavily favored to win the Cup. The Royals were unfazed and played a smothering team defense lead by forward Noah Polanski who's assignment was to shut down the opposing teams top player. Noah's role was changed mid-season and was a huge part of the team's run through the second half of the season. Noah shut down one of the leagues top scorers and Brooks Montgomery was lights out in net leading to CVCA's 3-1 upset victory. Bayley McRitchie, Christian Beckett and John O'Connor scored the goals for CVCA. The Royals then took to the ice against Mayfield High School in the semi-final game. It was all Royals as they continued their tenacious defensive play. Bayley McRitchie chipped in with two goals, Hayden Dickerson and Noah Polanski each scored. Brooks Montgomery was perfect in net as the Royals shut out the Wildcats 4-0 earning them a spot in the Baron Cup Championship for the first time in school history. The championship game was one for the ages. The Royals faced off against a tough Aurora team. The first period was scoreless with both teams getting chances but the goalies stood firm. The Aurora Greemen broke the ice in the second period taking a 1-0 lead into the third period. It was looking grim for the Royals when Bayley McRitchie scored to tie the score with just 5:55 left in regulation. That really picked up the Royals and they were swarming the Aurora net for the rest of regulation. It was on to overtime to decide the Baron Cup champions. Senior captain Hayden Dickerson, who had left the game earlier with a leg injury returned late in the game. Playing in considerable pain the captain scored the Baron Cup winning goal at 2:16 of overtime. The building erupted! The CVCA Royals hoisted the Baron Cup for the first time in school history! Congratulations to the 2016-2017 Royals - Baron Cup Champs!!! September 27th 2017. 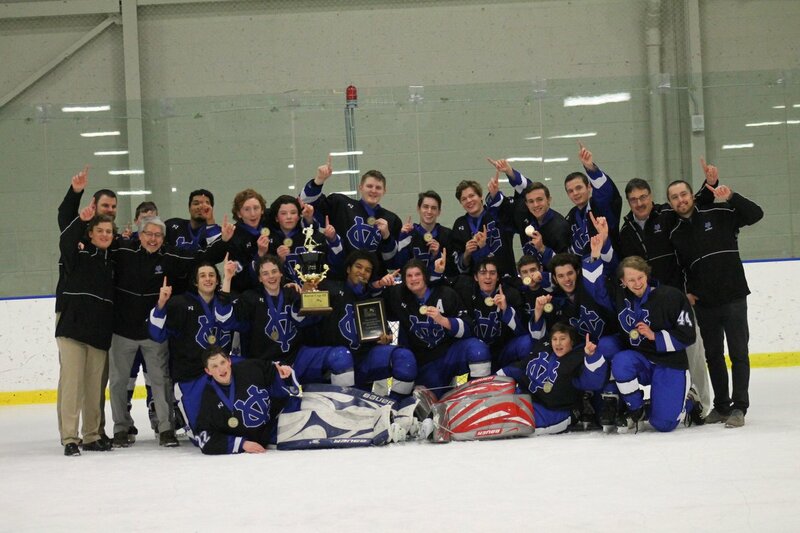 The Royals begin their 17th season in the Greater Cleveland High School Hockey League (GCHSHL). The Royals compete in the Blue North division again this season and look defend their Baron Cup Championship at seasons end. Here is how the Blue North and Blue South line up. Blue North: CVCA, Aurora, Avon Lake, North Canton Hoover, Normandy and Twinsburg. The Blue South: Brooklyn, Brush, Elyria Catholic, Garfield Heights, Lakewood, Mayfield, Nordonian. Romans 12:1, "Therefore I urge you brothers in view of God's mercy to offer your bodies as living sacrifices holy and pleasing to God- this is your spiritual act of worship."